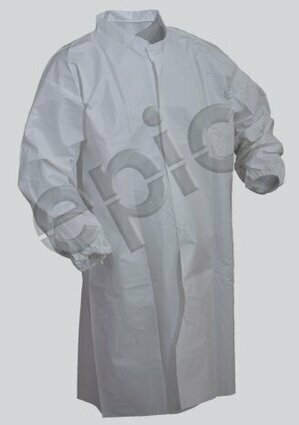 Tian's 846851 lint free film coated lab coat, for use in critical and low particulate clean environments. Suitable for exposure to bloodborne pathogens, non-hazardous liquids, and any wet general maintenance areas. Features include a snap front, elastic wrists, mandarin collar with snap and no pockets. Fabric is constructed from 100% virgin spunbonded polypropylene substrate laminated to 100% virgin micro-porous polyethylene film. The finished fabric contains an additive to provide anti-static properties. Individually inspected for sizing, stitching and workmanship. Neatly folded and cleanroom packed - 10 pieces per sealed inner polybag, 3 polybags per sealed master bag, 30 pieces per case.